Winnipeg Mayor Brian Bowman wants to stop anti-Semitic activist Linda Sarsour from participating in an event hosted in the Canadian city on Friday, CBC reports. Sarsour is set to speak at an event entitled, "Sorry Not Sorry: Unapologetically Working for Social Justice," hosted by the Canadian Muslim Women's Institute and the Social Planning Council of Winnipeg. "Mayor Bowman does not feel it is appropriate to provide this individual a public platform to further propagate anti-Semitic views and hate," Bowman's office said in a statement. During a city hall event on Tuesday, Bowman accused Sarsour of stoking "racialized identity politics" and said that "she has continually attacked the foundation of the state of Israel's right to exist." "It's less about the speaker than the social planning council providing that platform and the message it sends to the Jewish community and the community as a whole," Bowman added. The mayor's comments were supported by several Winnipeg organizations including the Jewish Federation of Winnipeg and B'nai Brith Canada – a national advocacy organization on behalf of Canadian Jewry. B'nai Brith Canada originally called on the event organizers to retract Sarsour's invitation. "She's used her platform to promulgate views that are highly problematic, including charges of dual loyalty to Jews who are considered sufficiently too supportive of the state of Israel," Ran Ukashi, a national director at B'nai Brith Canada, said last month. Accusations of dual allegiances among Jews have resurfaced in the national spotlight after U.S. Rep. Ilhan Omar's recent string of anti-Semitic comments. Last month, Sarsour led a group of Islamist activists to lobby on Capitol Hill against a resolution condemning anti-Semitic statements from Omar – despite the resolution failing to mention Omar by name. Sarsour has a long track record of making extremist comments and refuses to condemn Nation of Islam leader Louis Farrakhan's Jew-hating sermons. She not only is a vocal critic of Israel's policies – she despises the very principle that led to the Jewish state's emergence in 1948. "Nothing is creepier than Zionism," she famously wrote on Twitter. Zionists who failed to meet her threshold for sufficient support for Palestinians could not be feminists, she said. "I am an unapologetic pro-BDS, one-state solution supporting resistance supporter here in the U.S.," she told the Islamic Association of North America (ISNA) convention last September, the IPT exclusively reported. "One-state solution" supporters are clearly advocating for the destruction of the Jewish state by calling for one bi-national state with a majority Arab population. During the ISNA event, Sarsour also blamed Jews for police shootings of unarmed black people because of an Anti-Defamation League program that takes police executives to Israel to learn about fighting terrorism and riots. The ADL is the most prominent Jewish organization in the United States. Now, prominent Canadian Jewish organizations are working hard to prevent Sarsour from having a platform to spew divisive rhetoric. Local politicians across North America should follow Mayor Bowman's lead. Hamas and other Palestinian terrorist organizations decided to cancel Friday's weekly violent protests on the Israel-Gaza border to avoid an escalation with Israel, the Jerusalem Post reports. Palestinian terrorist factions leading the National Committee for the March of Return made the decision to delay Friday's demonstrations out "concern for our people" and to plan for larger protests commemorating Land Day at the end of the month. The decision came shortly after Palestinian terrorists fired two missiles at Tel Aviv Thursday evening. In response, Israel's armed forces struck 100 Hamas targets in Gaza, including an underground missile factory, a military training site, and a naval commando base. Terrorists fired at least nine rockets Friday on Israeli towns bordering Gaza in response. Hamas denied responsibility for the initial rocket launches. While the Israel Defense Forces assesses that low-level militants may have accidentally launched the rockets, Israel holds Hamas responsible for all terrorist activity emanating from Gaza. A Hamas official told The Times of Israel that the terrorist organization "has no interest in an escalation" with Israel. This decision marks the first time Hamas canceled the weekly event since violent riots and protests started on March 30, 2018. It confirms that Hamas and other Palestinian terrorist groups are the main drivers behind the violent riots, even though some international media outlets continue to frame the events as popular and peaceful protests. The decision to cancel today's protests shows that Hamas is not prepared for an all-out confrontation with Israel but is fully in control of the violent border situation. Palestinian terrorist groups have relied on these methods to attack Israelis and cause significant economic damage. Sporadic incendiary kites and balloons continue to land on Israeli territory. During the past year, these devices sparked destructive fires that burned thousands of acres of crops and natural forest area. The Investigative Project on Terrorism condemns the massacre of Muslims in two New Zealand mosques during Friday prayer by a self-described "ordinary white man" who "decided to take a stand." In it, he said he was inspired by Norwegian mass murderer Anders Breivik and decried a "large group of invaders" who "seek to occupy my peoples (sic) lands and ethnically replace my own people." House Speaker Nancy Pelosi caved to radical activists by watering down a resolution condemning anti-Semitism in reaction to Minnesota U.S. Rep. Ilhan Omar's anti-Semitic outbursts. Pelosi showed more determination after Omar's statements last month after she explained congressional support for Israel was "All about the Benjamins, baby," invoking a stereotype of Jewish money controlling U.S. policy. "We condemn these remarks and we call upon Congresswoman Omar to immediately apologize for these hurtful comments," Pelosi said. Now Pelosi claims that Omar's comments alleging a dual loyalty among Israel's supporters were not "intended in an anti-Semitic way," Pelosi said Thursday. Radical left-wing activists, including Linda Sarsour, representatives of the Council on American-Islamic Relations (CAIR), American Muslims for Palestine (AMP) and the U.S. Campaign for Palestinian Rights (USCPR), demanded that Pelosi and the Democratic leadership back away from condemning Omar Wednesday during a rally at the Supreme Court. CAIR Executive Director Nihad Awad complained that Israel has an undue influence on Congress and U.S. foreign policy. Awad notably attended a 1993 meeting of Hamas activists in Philadelphia that plotted to subvert the Oslo Peace Accords. Ramah Kudaimi, director of programs and operations with U.S. Campaign for Palestinian Rights (USCPR), argued Democrats should focus on anti-Semitism coming from the Republican Party, which she claimed has deepened "their relationship with white supremacists, white nationalists, and right-wing Israel forces – forces that thrive on Islamophobia and racism." Kudaimi charged that Pelosi was "implying that attacks on Muslim refugee women of color for their political stances are acceptable" by considering an earlier version of the resolution that only targeted anti-Semitism. The USCPR coordinates boycott and sanctions campaigns against Israel. A Tablet investigation found that it "helps facilitate tax-exempt donations to a Palestinian coalition that includes Hamas, Palestinian Islamic Jihad, the Popular Front for the Liberation of Palestine." A letter to Pelosi signed by Sarsour and more than 600 left-wing activists claimed that attacks against Omar were "rooted in both racism and Islamophobia." It called on Pelosi to condemn "anti-Black racism and xenophobia." They got just what they wanted. Instead of singularly condemning anti-Semitism, the new resolution dilutes decries "the reality of anti-Semitism, Islamophobia, racism, and other forms of bigotry, as well as the historical struggles against them." A passing reference to Omar's claim that Jews have a divided loyalty appears buried on the fourth page of the document in paragraph 18. Plenty of mention of white supremacist hatred of Jews can be found in the document, but the Muslim anti-Semitism that created this controversy to begin with is absent. Anti-Semitic activist Linda Sarsour on Wednesday ordered people associated with the Council on American-Islamic Relations (CAIR) to physically block former Wall Street Journal journalist and Muslim Reform Movement leader Asra Nomani from entering U.S. Rep. Rashida Tlaib's (D-Mich) office. Nomani, a longtime CAIR critic, posted video of the encounter. Sarsour is overheard in Arabic telling her crew to block Nomani's entry. "Don't let her [Nomani] be one of the first ones in. Do you all hear me? Come stand here. Don't let her be one of the first ones in." 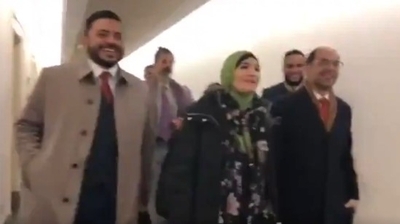 The video shows Sarsour with CAIR Executive Director Nihad Awad, Ahmed Bedier – former director of CAIR's Tampa chapter – and CAIR's Government Affairs Director, Robert McCaw. The group was on Capitol Hill to lobby against a resolution condemning anti-Semitic statements from Tlaib's colleague, U.S. Rep. Ilhan Omar even though the resolution does not name Omar. From its creation, CAIR was part of a Hamas-support network called the Palestine Committee. Awad was featured on a list of Palestine Committee officials whose mission, the Fifth U.S. Circuit Court of Appeals found, was to "support Hamas from abroad." Sarsour has espoused anti-Semitic smears worse than Omar's and advocates for one-state solution to the Israeli-Palestinian conflict – meaning Israel would be eliminated. Rejecting Israel's existence is a form of anti-Jewish bigotry according to the State Department's definition of anti-Semitism. "I am an unapologetic pro-BDS, one-state solution supporting resistance supporter here in the U.S.," Sarsour told an audience at the Islamic Society of North America's (ISNA) annual convention in September, the Investigative Project on Terrorism exclusively reported. These are the types of characters who meet privately with Rashida Tlaib to defend Ilhan Omar. Criticism and condemnation rained down last month on Omar, a Minnesota Democrat, after she tweeted, "It's all about the Benjamins baby" to explain why she and fellow Tlaib draw attention for their "criticisms of Israel." Facing serious backlash from many in her party, Omar issued a caveated apology. Omar has since doubled down on purveying anti-Semitic tropes, by depicting support for Israel as a form of dual allegiance. From the outset, Omar and Tlaib's Islamist backers immediately came to their defense. Wednesday's footage shows these radical supporters will not back down. Israel on Wednesday formally designated al-Aqsa TV, Hamas' main media outlet, as a terrorist organization. Israeli authorities revealed last month that Hamas recruiters posing as journalists conveyed secret messages to West Bank operatives via al-Aqsa TV. According to a recent report from the Meir Amit Intelligence and Terrorism Information Center, Palestinian terrorists often rely on media affiliations to communicate with operatives and avoid being targeted by Israel during conflicts. Some of these terrorist-media personalities include an al-Aqsa TV broadcaster and a correspondent for Hamas' al-Risalah media outlet who frequently report on the "return marches," Hamas-orchestrated protests on the Gaza-border. Hamas and other Palestinian terrorist organizations threatened last month to ramp up violence on the border to force more Israeli concessions. In recent years, Hamas operatives have recruited dozens of Palestinians from the West Bank and Jerusalem to conduct terrorist attacks against Israel. Some of the detained recruits revealed that Hamas operatives use Facebook to contact potential recruits and then relied on al-Aqsa TV broadcasts to convey covert messages. For example, Israeli security authorities learned during a December interrogation that Gaza-based Hamas terrorists asked Ahmed Abu Aysha from Nablus to recruit other Palestinians and facilitate a stabbing attack against Israeli civilians. Aysha received signals from his terrorist handlers via al-Aqsa broadcasts. In another case, Gaza-based terrorist Muhammad al-'Arabid, who previously posed as a journalist, recruited a young Palestinian from the West Bank to carry out a suicide bombing in Israel. The recruit was arrested several days before he expected to obtain an explosive belt. Since Hamas took over the Gaza Strip in 2006, al-Aqsa TV became the terrorist group's primary media outlet. In November, after Hamas fired more than 460 missiles and rockets at communities in southern Israel, Israel's military bombed the Hamas TV channel and affiliated radio stations after being deemed legitimate targets. Despite the bombing, Hamas funneled money to the station and continued to broadcast radical propaganda from a different location. Al-Aqsa – like other Palestinian institutions – offers programs specifically geared to recruiting children to embrace terrorism and become suicide bombers to attack innocent Israeli civilians. At the time, Israel acknowledged that Hamas media outlets help Hamas communicate with its fighters. Last month, Palestinian Security forces reportedly detained a Hamas-affiliated cell in Nablus which received directions from Gaza and planned to carry out several terrorist bombings in Israel. Despite Israel's campaign against Gaza-based operatives and media outlets, Hamas continues to recruit West Bank Palestinians to destabilize the Palestinian Authority and attack Israeli civilians. U.S. Rep. Alexandria Ocasio-Cortez, D-N.Y., on Tuesday retweeted an open supporter of the Popular Front for the Liberation of Palestine (PFLP), a State Department designated terrorist organization. U.S. Campaign for Palestinian Rights Yousef Munayyer wrote, "AIPAC activist tells NYT the lobby is coming for Congresswoman @AOC @RashidaTlaib and @IlhanMN. 'They are three people who, in my opinion, will not be around for several years.'" Tlaib and Ilhan Omar are new members of Congress who have drawn criticism for anti-Semitic statements that they claim are just criticisms of Israel. Ocasio-Cortez has defended her two colleagues. Ocasio-Cortez retweeted Munayyer's post, expressing her disappointment with AIPAC activist Stephen Fiske's statement to the New York Times complaining, "...[T]here seems to be no problem at all with a zero-tolerance stance for simply asking about US foreign policy." "The Palestinian liberation movement ... [seeks] to destroy the state of Israel as a military, political and economic establishment which rests on aggression, expansion and organic connection with imperialist interests in our homeland," the PFLP's says in its "Strategy for the Liberation of Palestine – The Aims and Significance of the Palestinian War of Liberation." The Boycott, Divestment Sanctions (BDS) movement seeks to isolate Israel politically and economically by encouraging boycotts of Israelis goods and the imposition of sanctions on the Jewish state. Munayyer runs the U.S. Campaign for Palestinian Rights (USCPR), the U.S. affiliate of the BDS Palestinian National Committee, which coordinates the BDS movement worldwide. Munayyer posted a PFLP communiqué in June 2017 announcing a stabbing attack in Jerusalem that killed an Israeli policewoman. It noted the terrorists had been previously faced "imprisonment by the occupation." Other tweets reminded people that the PFLP and other factions including Mahmoud Abbas' Fatah are fighting alongside Hamas "against Israel in this war." In a tweet last April, Munayyer told followers that Hamas leader Ismail Haniyeh held aloft a picture of imprisoned PFLP leader Ahmad Saadat in a show of solidarity. His group, the USCPR, made a similar post in 2016 mourning the death of a PFLP terrorist. A vendor at USCPR's convention last summer underscored the Boycott Divestment Sanctions (BDS) group's ideological orientation by selling a hat saying "Make Israel Palestine Again." The Democratic Socialists in America (DSA), to which Ocasio-Cortez belongs, passed a pro-BDS resolution in 2017. After it passed, activists chanted, "From the River to the Sea, Palestine Will Be Free," a call for Israel's elimination. Get caught repeatedly spewing anti-Semitic statements alleging that Jewish money controls American foreign policy, or that the planet's lone Jewish state has powers that "hypnotized the world" and what do you get? 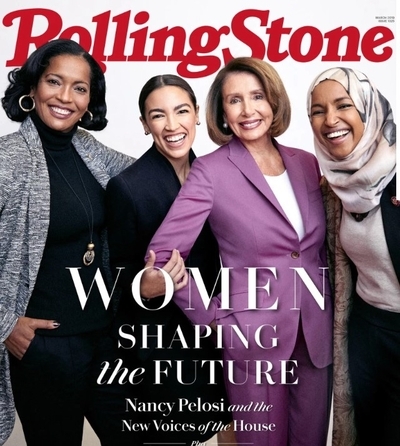 If you're freshman U.S. Rep. Ilhan Omar, it's the cover of Rolling Stone magazine along with House Speaker Nancy Pelosi. Omar, D-Minn., may see a consequence-free risk in continuing to espouse such hateful rhetoric. News reports Tuesday credited Omar with deleting past social media posts that also were anti-Semitic. But during an event in Washington, D.C. Wednesday evening, Omar launched another defensive rant that raised an anti-Semitic dual loyalty canard against critics of her anti-Semitism, the Jewish Insider reports. U.S. Rep. Radhida Tlaib, a fellow freshman in Congress and Palestinian American who, like Omar, supports a global economic, academic and cultural boycott against Israel, was seated next to Omar. "...because Rashida and I are Muslim," Omar said, "that a lot of our Jewish colleagues, a lot of our constituents, a lot of our allies go to thinking that everything we say about Israel to be anti-Semitic because we are Muslim ... And so to me it is something that becomes designed to end the debate ... And that ends the discussion. Because we end up defending that and nobody ever gets to have the broader debate of what is happening with Palestine. "So for me, I want to talk about the political influence in this country that says it is okay to push for allegiance to a foreign country." In defending herself against claims she's an anti-Semite, Omar said Israel's supporters are trying "to push for allegiance to a foreign country." This is at least the third strike by Omar. House leadership forced her to apologize earlier this month after she tweeted "It's all about the Benjamins baby" to explain why she and fellow Democrat Rashida Tlaib draw negative attention for their "criticisms of Israel." Who is the source of this slang reference to cash? "AIPAC!" Omar added, referring to the American Israel Public Affairs Committee. During a 2012 conflict between Israel and Hamas in Gaza, she cried out that Israel "hypnotized the world" and prayed that "Allah [would] awaken the people and help them see [its] evil doings ..."
When supporters tried to raise money for her re-election campaign despite the apology, Omar said nothing. Her "all about the Benjamins" quip prompted many critics, including the Investigative Project on Terrorism, to call for her removal from the House Foreign Affairs Committee. She got the cover of Rolling Stone instead. What price will she pay for pushing the dual loyalty slur? Maybe they'll promote her to chairwoman.